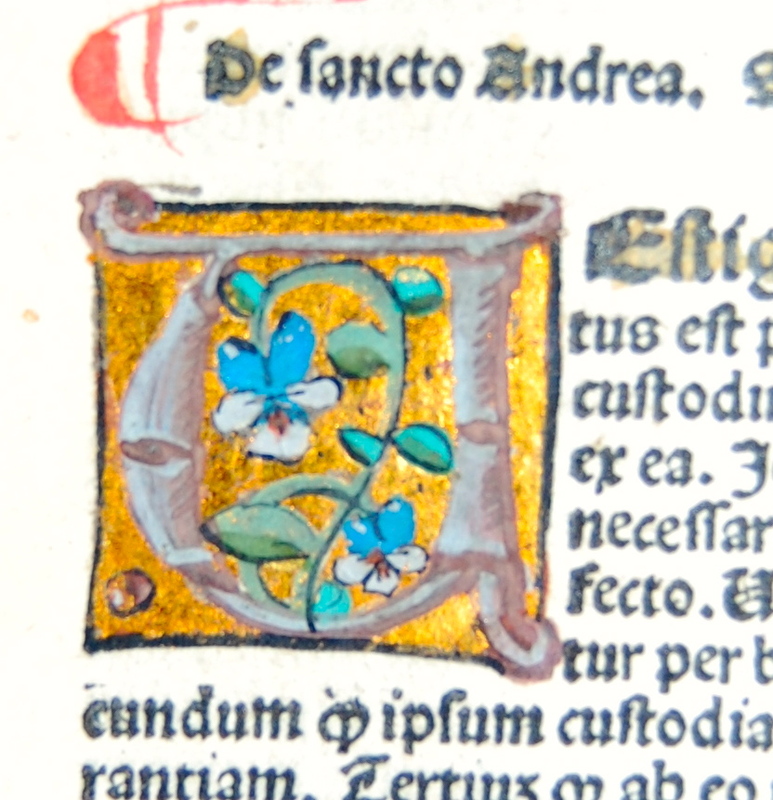 Quarto in eight s, 8 x 5.5 in. This copy is bound in nineteenth century quarter calf over red paste paper boards: It it rubicated in red and blue through out, with the beginnings of books have initials which have been painted with gold and ornate flowers. 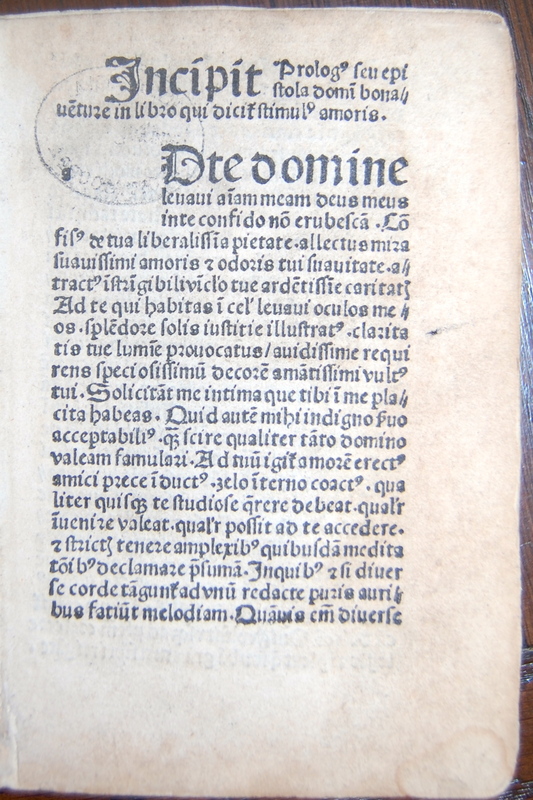 Stimulus Divini Amoris devotissimus a sancto Johanne Bonaventure editus cordium omnium in amorem christi Jesu inflammatius post eiusdem varias impressiones incorrectas ultimate emendatus et correctus per eximium sacre pagine professorem Magistrum Johannem quentin canonicum et penitentiarum parisiensem. Octavo, 5.5 x 4 inches. 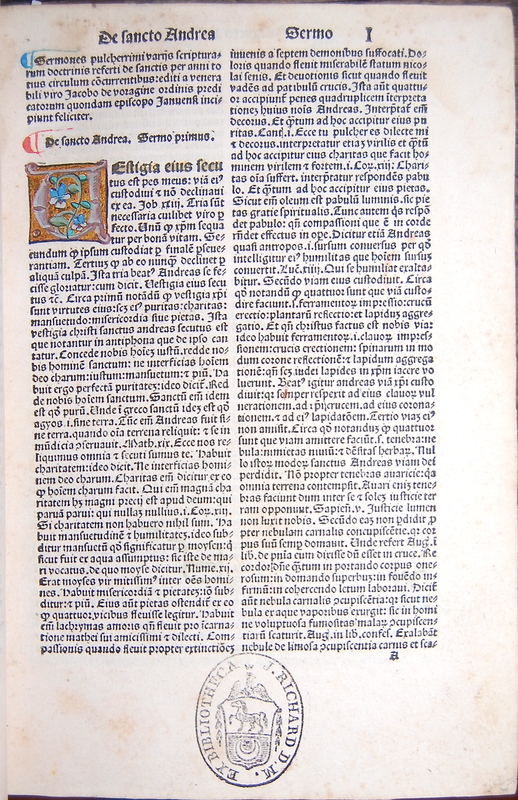 Fourth edition, a7 (lacking title leaf) -R8 (last two leaves blank and lacking). This copy is bound in paper boards. 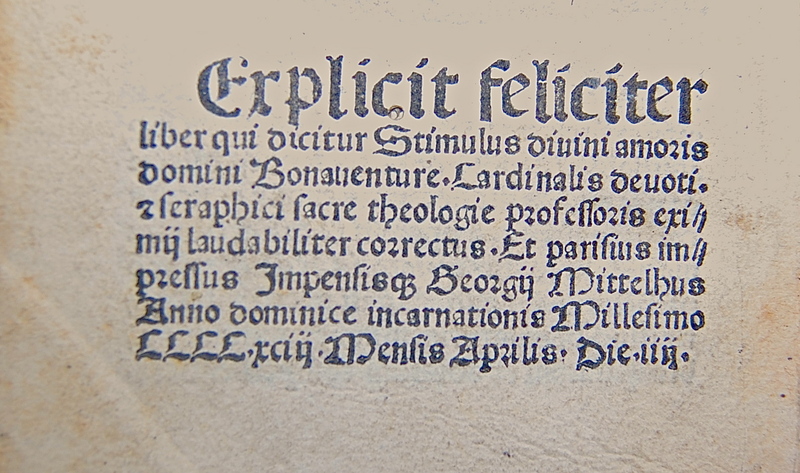 “The Stimulus Amoris is a composite devotional work consisting of an independent series of meditations on the Holy Passion, of still unidentified authorship, followed by a treatise on the spiritual life and contemplation by Jacobus Mediolensis, and ending with some anonymous meditations on the ‘Pater Noster,’ ‘Ave Maria,’ ‘Salve Regina,’ etc. “The Stimulus appears in several versions, but the one that became very popular in the fourteenth and fifteenth centuries is this longer work, known in England as the Prikke of Love. 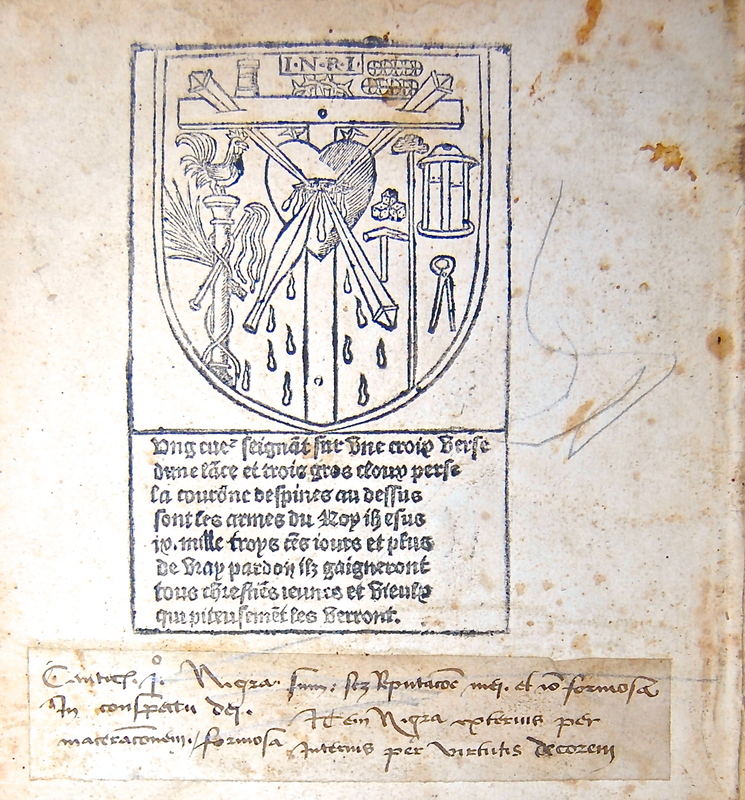 [By the fourteenth century] one or more scribes had added the chapters on the Passion to the treatise of Jacobus and had vastly amplified that author’s work. 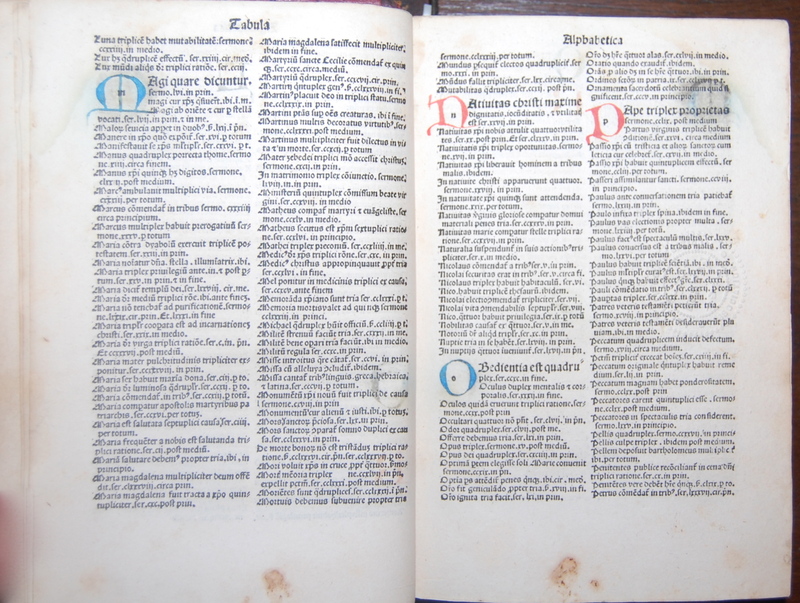 Jacobus’ short treatise consisted of twenty-three chapters, in no perceptible order, some of which embodied fragments from St. Bonaventure, St. Bernard, and Saint Anselm.